The title of this post has been my motto for what feels like forever, reminding me to focus as I pushed myself through a rather gigantic writing project. Last week I turned in a manuscript that I’ve been working on for close to two years, which needless to say is a highly emotional (albeit somewhat fraught) relief. 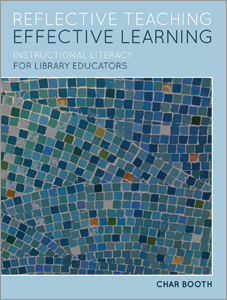 The book, Reflective Teaching, Effective Learning: Instructional Literacy for Library Educators, is basically me doing my damnedest to present usable, practical strategies for the similarly emotional (albeit somewhat fraught) challenge of being a library educator. If I were to assign a series of faces to the relief I now feel, it goes without saying that first in line would be my indefatigable editors Lia Friedman and Emily Drabinski (thank the maker for you both), followed lockstep by Librarian in Black Sarah Houghton-Jan for penning an awesome foreword, not to mention the countless amazing librarians who contributed thoughts and ideas to this project. The book will be available via ALA Editions in the fall of 2010 in e- and print versions. 1 | Librarians are often in the business of teaching, yet we are infrequently taught principles of doing so effectively. As we lead classes, present, train, and create learning materials, most of us know we should ground our efforts in evidence-based practice, yet without a programmatic instructor development background our anxiety is exacerbated in the trenches. 2 | Education is an integral element of librarianship – we support users as they develop personal learning and research environments, and we guide ourselves and our colleagues in a constant process of adaptation to the changing information landscape. 3 | In my professional heart of hearts I hold four things dear: libraries, learning, technology, and design. Integrating these elements is a constantly rewarding challenge in my own practice, and I try to share viable strategies towards this end. Balancing a strong, self-aware identity as an educator with informed pedagogical and design knowledge is the best way to create effective learning experiences. Better learning experiences lead to more engaged students, which in turn produces greater teaching satisfaction and impact. In RTEL I present the four-component development framework of instructional literacy – reflective practice, educational theory, teaching technologies, and instructional design – elements that, when cultivated in tandem, lead to sound and dynamic teaching practice. I also explain the USER Method, an instructional design approach I created to support the step-by-step development of personalized, and student-centered learning experiences (USER = Understand, Structure, Engage, Reflect). In the process of producing RTEL, the relatively self-evident notion that not all writing is created equal has hit home in a big way. Whereas tweets and status updates are short and sweet, writing a book can be distended and bitter. Blogging occupies a strange middle ground that I have missed over the past year or so, wherein the positive pressure of timeliness, thoughtfulness, and consistency produces a conversation that is at once immersive and immediate to the author. In the process of burning so many book candles at so many ends, I’ve become ironically inconspicuous as a blogger at one of the most productive times in my writing life. I have confirmed that for me writing a book and maintaining a blog at the same time is relatively impossible, an observation that as been made before (and much more succinctly, I should note). As someone who began writing as a blogger, producing monographs has been an almost inconceivably difficult struggle, and for more than the complex cognitive magnitude of memory/organization/revision it entails. The greatest challenges of all from the book v. blog perspective are delay and unresponsiveness. As much as I have adored the process, it has been profoundly frustrating to do so much thinking, planning, writing, and rewriting, all of it bent on practical application, that has remained relatively inaccessible as it was refined. Even now, the actual manuscript won’t be available for a number of months as it runs the publication gauntlet. More than the relative ease pf production, the benefit of being an author via social media is that reader reaction time is instantaneous and public – someday I hope to produce a long-form project along the model of Planned Obsolescence, which allows paragraph-level commenting in a strong example of integrating crowdsourced dialogue into the peer review process. I believe rather fiercely in open scholarship, so in recognition of the fact that not everyone wants to buy entire books about teaching it goes without saying that I am happy to now resurface and start communicating about the project in a space that produces conversation without cost. My first book was released as a free download, and although I cannot say the same in this instance I will at least attempt to share as many gratis ideas as possible. to a piano sideways, which comes from Carson McCullers, one of my own favorite authors (and if you’ve never read The Ballad of the Sad Cafe, you are seriously missing out). Her full quote is actually that “Writing is like giving birth to a piano sideways. Anyone who perseveres is either talented or nuts.” To this, I would add two other options: hard-headed and/or head over heels. If writing a book is metaphorical labor, it is most definitely one of love, requiring abject dedication to a drawn-out process of gestation and cultivation one can only hope will produce an object worthy of pride (as opposed to prejudice). Although I have never experienced literal delivery, the pain of its literary equivalent is directly proportional to the period of gestation and/or the length of the final product, both of which up the ante for increased necessity of external intervention. To labor the analogy (so to speak), if tweeting is like trimming a hangnail, writing a book is like giving birth slowly and painfully over a period of years, only to discover that you have been at it for so long that you have produced a surly teenager that needs to be sent to charm school before it is ready to be anything but a danger to polite society. No author writes alone: if they do, they are likely to produce an even more consummate maladjust. No matter the format, the more positive socialization a piece, post, or paper receives, the more likely it is to develop the manners and presence of mind enough to be presentable. Subjecting oneself to scrutiny of any kind is an exercise in graceful vulnerability. In this way, teaching is quite similar to writing – both require you to cultivate a sense of resilient openness to critique that is intrinsic to operating productively in a community. This type of radical responsiveness is a theme I explore throughout the book. RTEL strategizes around leveraging your community and your vulnerability in order to become a more productive teacher and learner. Cultivating your instructor identity as you bring proven design techniques and technologies to everything from handouts to credit-based classes to online tutorials is the way to make this happen. In sum, I have tried to write a book for librarians who want to broaden their view of education as they empower themselves to improve the learning experience. As with any other instructional exercise, the proof of my success will come in the form actionable knowledge; I therefore look forward to observing the productivity quotient of this particular labor of love. i only had to read the book (which was a pleasure and a joy) and throughout i marveled at your endurance, stamina and skill. now i can look forward to more reading, of your blog that is, knowing its an easier process while still being a total benefit for me! friedman, touched by an angel. I used three of the strategies you talk about in your book just this Tuesday, and that is the truth. It’s a terrific piece of work, and we’re all lucky you subjected yourself to it. It’s a real gift. omg, tell me more. and thank you much, brainiac. So, yeah! And there will be more where that came from, for sure. I hope people use your book to start more conversations with each other about how we teach. i love it, thanks for explaining. amen to starting some conversations. sarah, thanks for your praise. that you will recommend it is a personal triumph, as you are the mistress of the practical/worthwhile. again, thank you for lending your voice at the get-go. I haven’t looked at the book yet, but CONGRATULATIONS! on its appearance, and thanks for the meditation on the creation process! thanks, ben. i thought you might like this post. so, which is it – barbed wire or sideways piano? The news that your book is officially on the way is wonderful. Having recently been exploring the need for more reflection in learning, I can hardly wait to dive into what you’ve written. much appreciated, paul. looking forward to your/lori’s upcoming book, too. This post mentions Flannery O’Connor and The Ballad of the Sad Cafe. Are those two items related somehow that I am not aware of? Carson McCullers wrote The Ballad of the Sad cafe….and I agree it is wonderful. Thanks for all your hard work Char Booth. I am a huge fan. You are quite a refreshing inspiration. man, guilty as charged: carson mccullers, corrected. thanks.